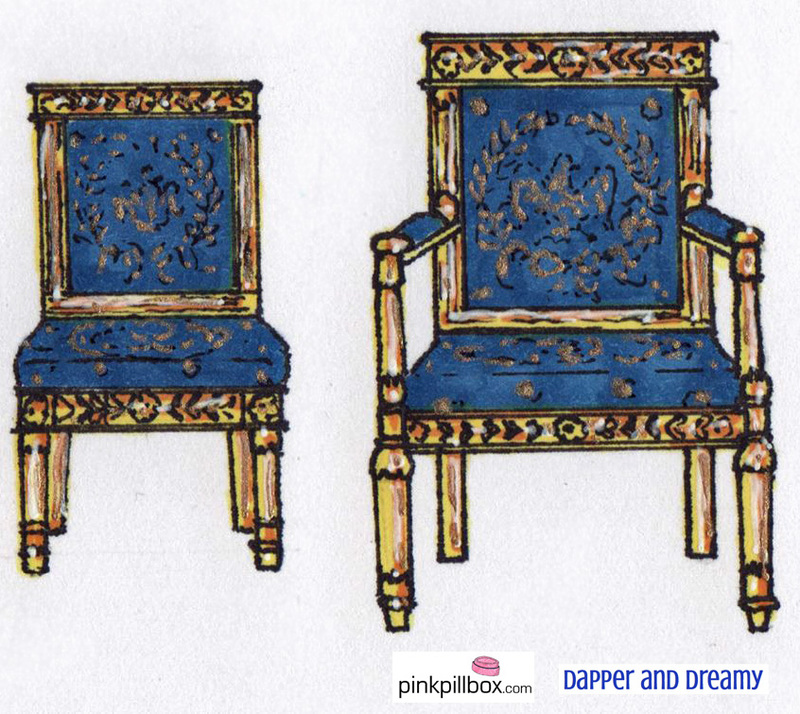 March 20, 2015 Notes: Rendering of the Monroe era Bellangé chairs in the White House Blue Room. The room is furnished in the French Empire style. A series of redecoratings through the 19th century caused most of the original pieces to be sold or lost. Today much of the furniture is original to the room. Eight pieces of gilded European beech furniture purchased during the administration of James Monroe furnish the room, including a bergère (an armchair with enclosed sides) and several fauteuils (an open wood-frame armchair). The suite of furniture was produced in Paris around 1812 by the cabinetmaker Pierre-Antoine Bellangé, and reproduction side chairs and armchairs were made by Maison Jansen in 1961 during the Kennedy restoration. 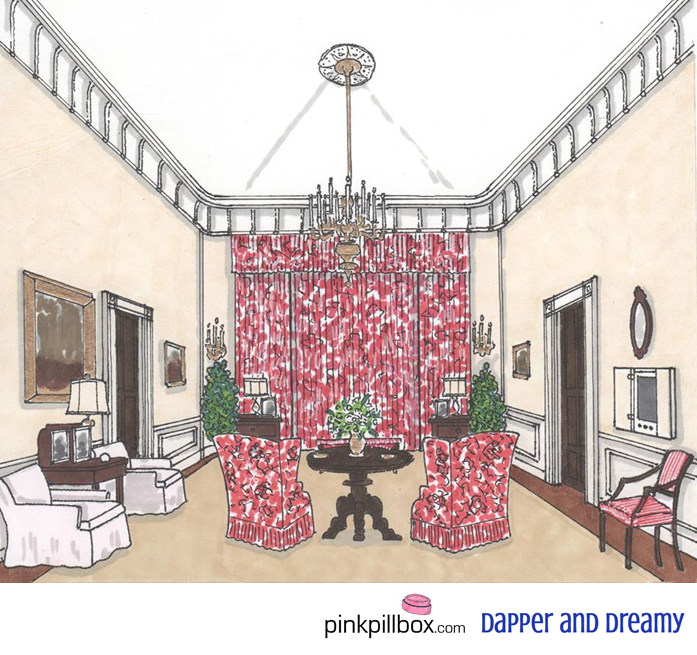 March 8, 2015 Notes: Rendition of the White House West Sitting Hall as decorated by Truman. The featured fabric was by Scalamandré. The room is a favorite of First Families, with the large fan window filling the room with light and offering great views of the Rose Garden and Oval Office. The door to the left leads to the "Presidential Bedroom Suite" and to the right is the "President's Dining Room" and kitchen installed by Jackie in 1961. The red and cream toile was called "The Victory of Washington and the Apotheosis of Benjamin Franklin." It shows Washington in a leopard drawn chariot with the Goddess of Independence and Benjamin Franklin with the Goddess of Liberty carrying a banner with the words "Where liberty dwells there is my country." Jackie liked the fabric so much, she and Boudin would use it for the Empire Guest Suite on the third floor. 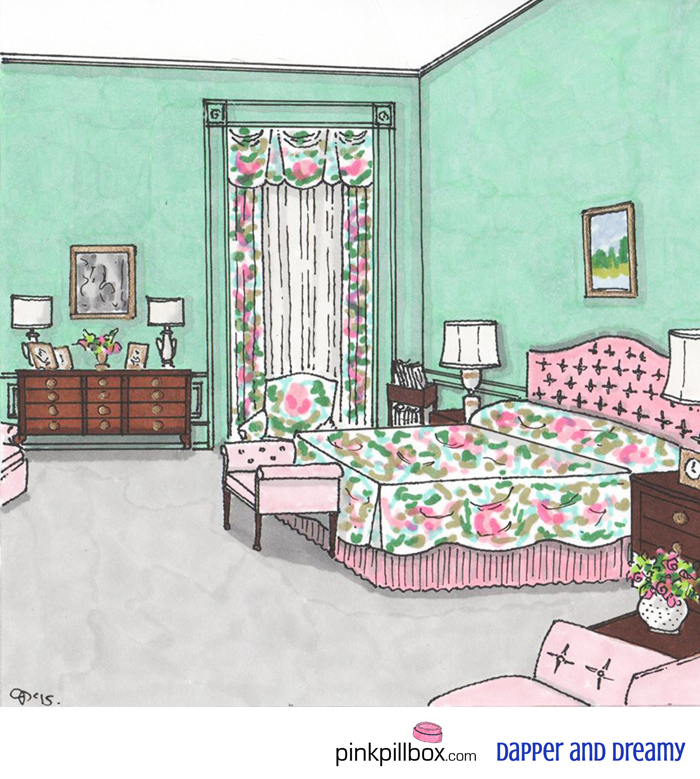 March 5, 2015 Notes: Rendition of Mamie and Ike's White House bedroom by Jake Gariepy. The curtains were by Scalamandré (a glazed chintz in green and rose on a cream background taken from a Louis XVI printed called "The Triumph of Hymen") and were first used in Margaret Truman's bedroom across the hall. The painting over the bed was by Ike and the pink headboard would reappear during the Ford administration. The chest between the windows would also be used by several other First Couples. Although a decor typical of its time (late 1950s), Jackie had other plans and would transform the space to closely resemble her Georgetown bedroom at 3307 N. Street. 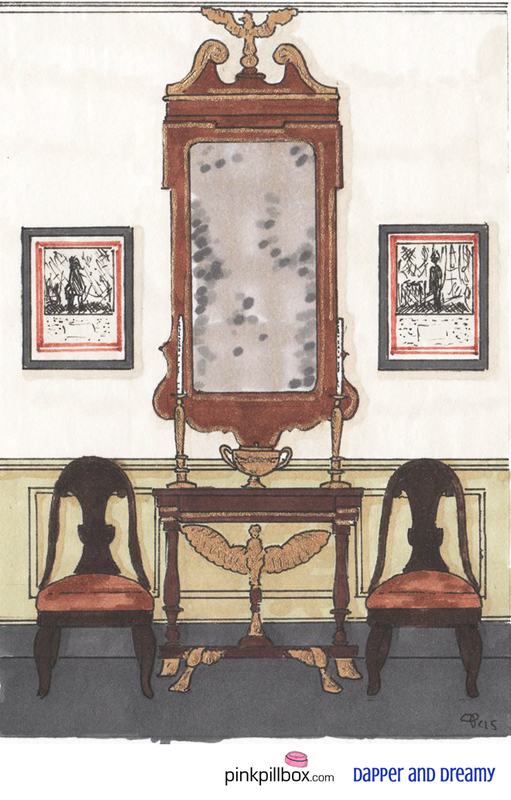 February 21, 2015 Notes: Rendition of the White House second floor elevator hall in the private residential quarters circa 1962, showing a Lannuier swivel-top card table (circa 1815 sold at the 1996 Sotheby's auction for $107,000), lithographs by W. H. Brown (circa 1830s sold at the 1996 Sotheby's auction for $7,475) and a Chippendale mirror on loan from Mount Vernon attributed to President Washington's "Presidential Palace" in Philadelphia (circa 1790s).